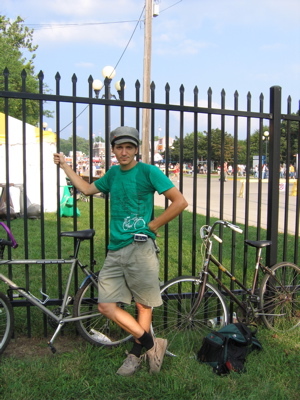 After a fun ride through all of Des Moines, my coworker Jess and I arrived to the East Side, and the Iowa State Fair, in cycling style. As our other coworker Dave drove around looking for parking, we cooled down and spoke to the few bikers that rode up to lock down. On the ride over (about 6 miles total), one driver cussed us for cutting through traffic to avoid hitting mirrors while riding in the gutter. Another local yelled “You’re crazy!” as we sped by. “I do crazy things on my birthday!” I yelled back. Living in Middle America now, I completely understand why our society is overweight, out of shape, and having major health problems. Here at the Iowa State Fair, you can eat unhealthy food to your heart’s content. 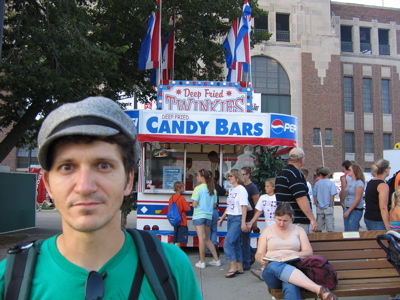 The booth behind me serves up deep fried Twinkies and candy bars. 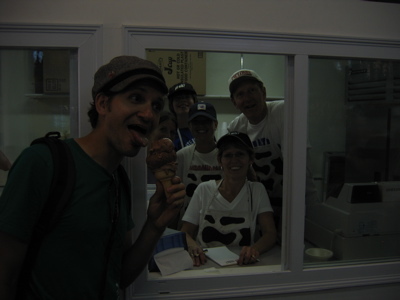 Other booths served beef sundaes (mash potatoes as the ice cream), chicken/pork/beef on a stick, deep fried pickles, deep fried cheesecake… you get the picture! No wonder people were confused at my wanting to bike to this event. I’m licking one scoop of tasty Iowan ice cream. I asked these folks “do you have any birthday specials?” and they said no. They sang “Happy Birthday” to me instead and posed for this pic (dark b/c Jess mussed the settings). 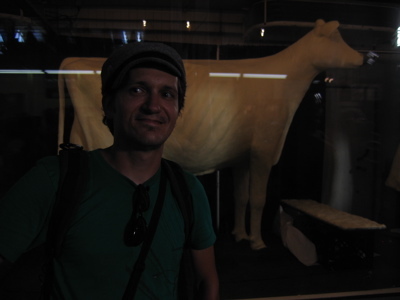 The Butter Cow! My mom should be so proud of me now. Superman stood next to the cow. He’s from Iowa ya’ know. Dave said that a new artist made the cow this year. That’s a big deal at the state fair. 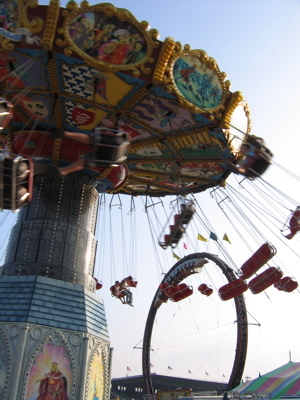 The Iowa State Fair had a huge carny section, oddly named the Blue Grass area. Jess insisted that we check out the insultant dunk machine guy. He had a crowd, good lines, and an annoying laugh. Played a few games on the midway and listened to one carny babble nonsense into his mic. 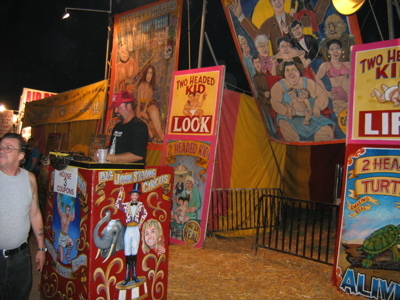 We all checked out the carny freakshow. They had stuff in jars (a three-legged chicken, a two headed pig, etc. ), a real, live super tiny pony, and a live, two-bodied turtle named More and Less. 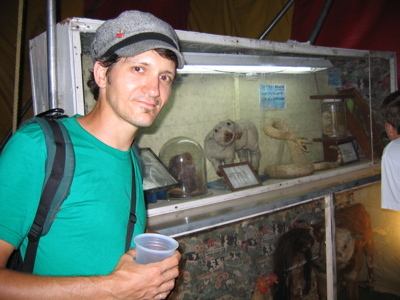 That’s a boa on the carny’s podium. A snake with a crocodile head. A two-headed lamb, shrunken heads. Unless you like gluttons and mullets, this doesn’t get too much better for a birthday treat!